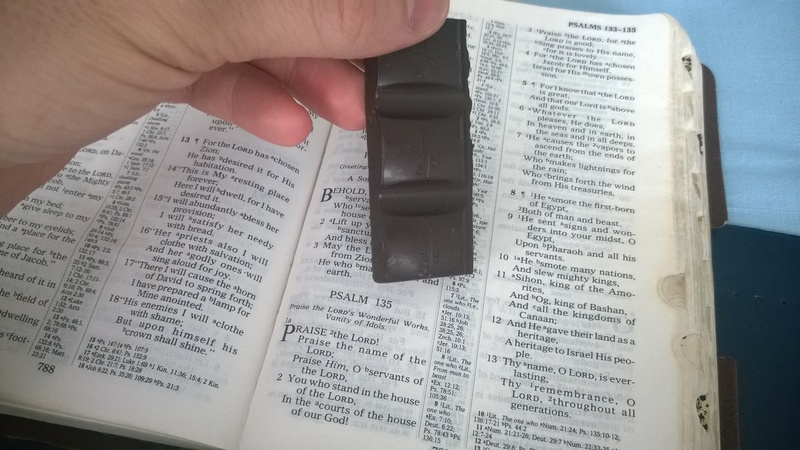 Psalm 135 isn’t exactly a brief history of the universe, but that’s the closest I can think of to a one-sentence summary of it. Going by Brueggemann’s classifications, it’s generally considered a psalm of new orientation, but I personally am inclined to read it as simple orientation. It’s a call to praise founded on conviction that God is good, and the only hint of having passed through disorientation (vv.8-11, recollection of Israel’s struggles against Pharaoh and various pagan kings) is a historical footnote, a distant memory at most. Moreover, it’s equal parts assertion of God’s supremacy, litany of Israelite history, and indictment of idolatry. If it evades encapsulation into a single summary with a single theme, then we can roll with that. After the initial call to praise, the psalmist asserts God’s ontological priority. He declares: “For I know that the Lord is great and that our Lord is above all gods. Whatever the Lord pleases, He does” (135:5-6). In the psalmist’s picture, God is at the top of the ladder of reality, higher than the highest beings in all time and space, and no one can stop him from doing as he wishes. Picturing God as the keeper of treasuries of wind, verse seven calls to mind Job 38:22, in which God keeps storehouses of snow and hail. As Lord of the Universe, God has all the weather he needs. The psalmist then moves into a litany of God’s works in Israel’s history, most notably smiting kings and bringing his people to the Promised Land–and then, just as suddenly, the psalmist launches into a critique of idolatry. And we’ve seen this kind of critique before, almost word-for-word: Psalm 135:15-18 strongly parallels Psalm 115:4-8. When the psalmist calls idols “[mere] silver and gold, the work of man’s hands” (135:15), when he reminds us, “They have mouths, but they do not speak; they have eyes, but they do not see…” (135:16), and when he concludes that trusting in idols makes a person just as impotent as the inanimate objects he’s relying on–in all three of these instances, Psalms 135 and 115 are nigh-verbatim lyrical twins. And while Isaiah doesn’t follow the pattern word-for-word, he hits the same points in Isaiah 44:9-20. I don’t know which passage preceded the others historically, but when it comes to idolatry, the Biblical authors were not afraid to repeat themselves, and they evidently didn’t care about copyrighting their invectives. Perhaps we would do well to follow their example and be less possessive of our own words? I don’t know. 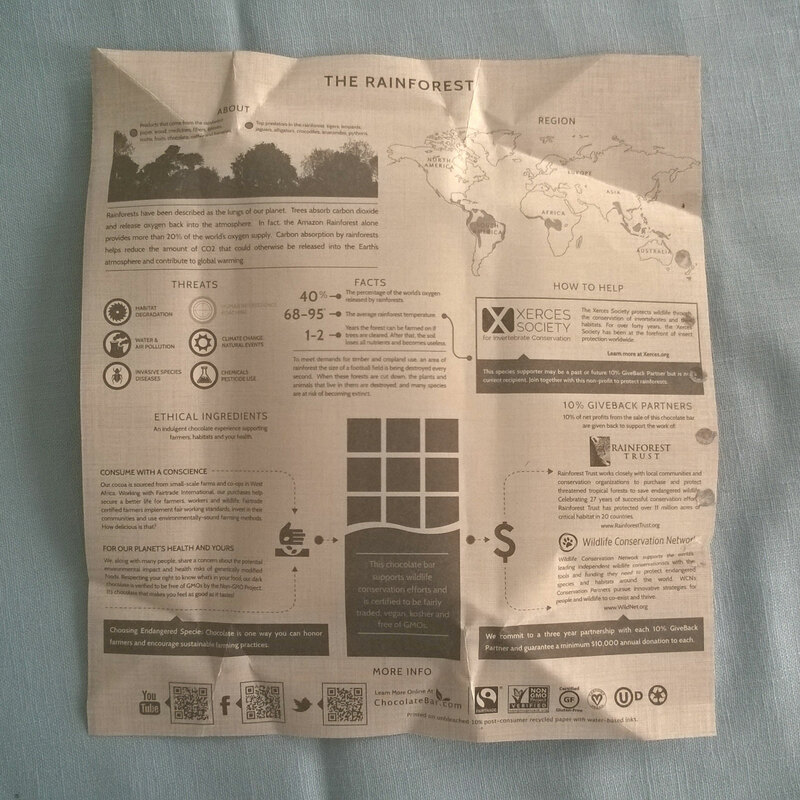 Today, as I finish up this mint bar of Endangered Species chocolate, I wanted to call attention to the interior of the wrapper, which presents several facts about the rainforest. Rainforests provide 40% of the world’s oxygen, and also absorb carbon dioxide from the atmosphere, which helps reduce the global warming phenomenon. God made this planet, and he’s involved in its continued well-being; as the psalmist says, “He causes the vapors to ascend from the ends of the earth; [He] makes lightnings for the rain…” (135:7). God has fine-tuned the balancing mechanisms of the world. As his creations, we have a responsibility to maintain the intricate natural systems he’s designed and put into place; he’s charged humanity with taking care of the Earth. Ecological conservation can be an act of worship. Take good care of the Earth, fam. Posted in Daily Reading, Genesis, Isaiah, Old Testament, Psalms.Tagged bible, christianity, environmentalism, God, history, idolatry, Israel, Psalms, scripture, worship.